This past year the universe of Warhammer 40,000 has really captured my imagination. Part of it is nostalgia, part of it is just the setting and all the fluff. The only novels I've read in the last year have been Black Library novels. Probably 90+% of the miniatures I've painted in the last year were 40K figures. I'm really having a lot of fun with it. That's not to say I'm not at all interested in historical stuff any more - I totally am. I just picked up Rebels and Patriots - and really looking forward to getting a chance to play it. But it'll have to be with minis I already have painted, because, for the time being, the only thing I seem to be interested in painting is 40K stuff. At some point the winds of change will blow through here again and it will be all redcoats all the time... Until then, I'm riding the 40K wave. ...and then I picked up Wrath & Glory last week - which had FINALLY arrived at my FLGS (Dragon's Den Games in Saskatoon, Saskatchewan, Canada). So after a brief consult with all the players involved, the Winter Wargaming Weekend is now going to be a Wrath & Glory RPG Marathon Weekend! Wooo! I was going to say I've never done anything like this before, but after thinking over that statement, I'm pretty sure there were some Jolt-Cola-fuelled, weekend-long, D&D/Star Frontiers/Top Secret/Palladium Role-playing game sessions in my teenage years... (the Jolt probably killed the brain cells where those memories were stored...). The book is interesting, I referred to is as an "adventure anthology" because I'm not sure it's really a "campaign" per se... There is an overarching narrative, it all takes place on the same planet, and in the first four adventures all the characters are working for the same Rogue Trader... but each adventure is meant to be played at a different Tiers. The game, Wrath & Glory, is designed to be played at different Tiers - there is such a wide variety of archetypes that can be played and they vary so greatly in relative power level - I mean, stuff that a Space Marine could face down would end up with a Total Party Kill for a group of Guardsmen. So Tiers... Tier One is Imperial Guard and Gangers and the like. Tier Two is Space Marine Scouts, Sisters of Battle. Eldar Rangers, Skitarri, and Sanctioned Psykers. Tier Three is Tactical Marines, Tech Priests, and Eldar Warlocks. Tier Four is Inquisitors and Primaris Marines, etc. You get the idea. Now you CAN have Imperial Guard playing in a game with Space Marines - you just take the Guard archetype and "ascend" them to Tier three - whic mostly involves giving them the extra build points and some background reasons for why they're the most bad-assiest veteran guard trooper ev-ar... So the difference between a Tier One Imperial Guard soldier and a Tier There Imperial Guard solider, one would think is decades of war-fighting and experience. It doesn't seem like decades pass between adventures, as they are somewhat related to each other... maybe a few months could take place between them, maybe a year, but not really long enough to realistically expect a character to ascend to a whole new Tier. So I was wondering if each was meant to be played with an entirely different group - players making new characters at the new Tier between each game... but then I got to one of the later adventures and it the introductory blurb the Rogue Trader mentions having to "call upon [the characters] once again"...? Which makes it seem like it IS supposed to be the same group...? I don't know... I'm giving them the option of either making a new character for each Tier or simply ascending a character. The Fifth Adventure definitely requires making new characters - as it shifts focus entirely and the characters are supposed to be Aeldari working for a Farseer!? Still in the same system/planet/hive-city... and even involved in the same plot-line... but from an entirely different point of view. perhaps it's meant to be an opportunity to try out playing different archetypes at different Tiers to figure out what level you really like playing at? Regardless, it should be a fun time! I've got to go get some reading done! ...and I do like taking pics outdoors in natural light... So yeah, those pics might have to wait a day or two! Sounds like it will be a fun weekend event Tim! Sorry for the cold, but at least your not in Winnipeg! Thanks Terry. 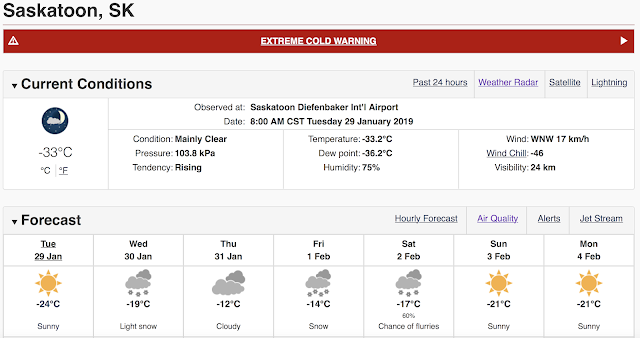 Yeah, I'ma jus' stay inside and drink hot chocolate today! Wrath and Glory sounds really interesting, a kind of variant of Rouge trader? Your really are on a 40k roll at the moment! It's more or a completely new role-playing game set in the grim, dark, universe of Warhammer 40,000. System is totally different, character generation is totally different. It's kind of bare bones at the moment, but I expect there will be plenty of supplements coming out in the months and years to come. Already you can play an Eldar - which was never an option in ANY of the multitude of Role-playing games put out by FFG. 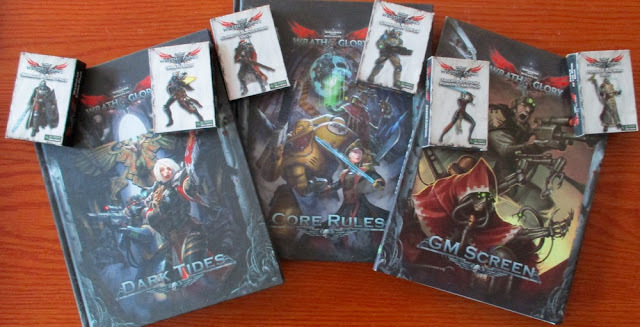 While FFG had a PILE of very similar, but different games - each requiring their own core rulebook (Dark Heresy, Only War, Rogue Trader, Black Crusade, Death Watch, etc...) This system has ONE core rulebook and they're promising more expansions. I think the first is supposed to be Dark Imperium - which will likely expand Imperial (and perhaps chaos) archetype options. There is also a rumoured Eldar book in the works. The system itself is a LOT simpler that all the FFG games. I am really looking forward to the game weekend and then getting a regular campaign going on! It's finally here!! I know you pre-ordered your's but do you know if Dragon's Den has more physical copies? They had shelf copies when I went and picked mine up. But I picked mine up the day they showed up in the store a week ago, so.... they may or may not have any more copies. Best check with them!